Hope everyone is doing well. I know I have been super busy lately but if anyone is curious about what I have been up to lately stay tuned. Last month, I went to New York for a work trip, and that was really fun. Every night we made reservations to eat at different restaurants that we found on Instagram! Thank you, Instagram, for being a lifesaver on where to eat. I think that most of my inspirations come from either Instagram or Pinterest. Also, one of my best friends got married last month; thus, bridesmaid duties called for. The ceremony was beautiful, and it was a great weekend to be a witness to two people so in love. In the summer, it’s hot enough to wear this jumpsuit on its own but in the autumn I would pair this with camel color jacket and booties. If you follow me on Instagram, I’ll show you how I dressed it up for the fall time. Location: Magic Garden in Philly. This place was seriously so magical. 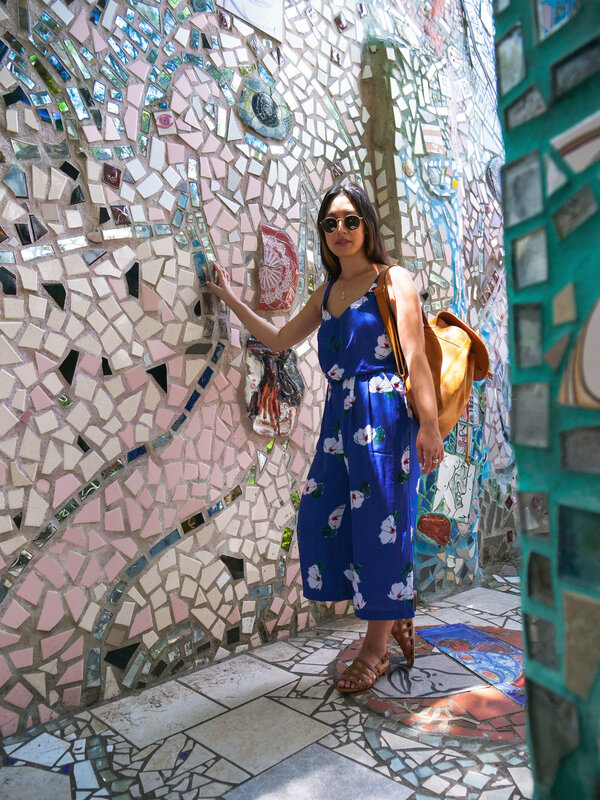 A garden filled with mosaics made by Isaiah Zagar.